It fits into any control cabinet and can be started up immediately – the MOVITRAC® LTP-B frequency inverter with IP20 housing. Compact design and simplified handling give you a versatile range of possible applications and make startup quick. Frequency inverters that make your life easier! Connect, choose your motor, perform the automatic calibration and your application will just run and run. Designed and developed for open-loop speed control of synchronous and asynchronous motors, the MOVITRAC® LTP-B with IP20 housing is available with up to 15 kW of power. This allows you to complete your tasks in conveyor applications, hoists, fans and pumps with a high level of energy efficiency – even without an encoder. Why make it complicated when it could be so easy? That’s what we were thinking when we designed the range of functions and the operational principle for our MOVITRAC® LTP-B series. The result? Compact functionality and an integrated control plate that makes handling easy for you. Reduce your energy costs, not your power! Thanks to the energy saving function in the partial load range and when idling. 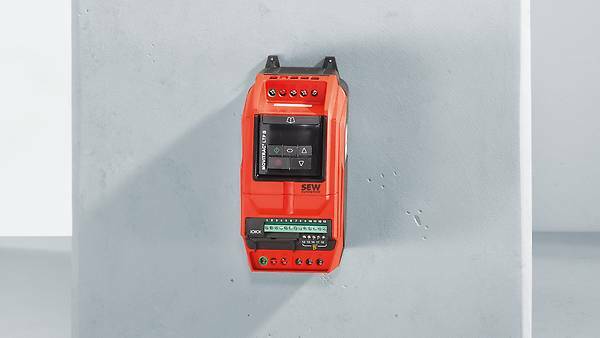 And thanks to the STO (Safe Torque Off) safety function, these frequency inverters are not just safe and compact – they are also economical and efficient. If you require frequency inverters for wall mounting just order the design with a high degree of protection. thanks to the integrated control plate and 7-segment display. thanks to the STO (Safe Torque Off) safety function. The adapted range of functions of the MOVITRAC® LTP-B guarantees optimum energy efficiency, even for simple applications. The MOVITRAC® LTP-B standard inverters in IP20 come with the “Safe Torque Off” (STO) safety function in accordance with EN ISO 13849-1 PL d and EN 61508 (1-7) SIL 2.